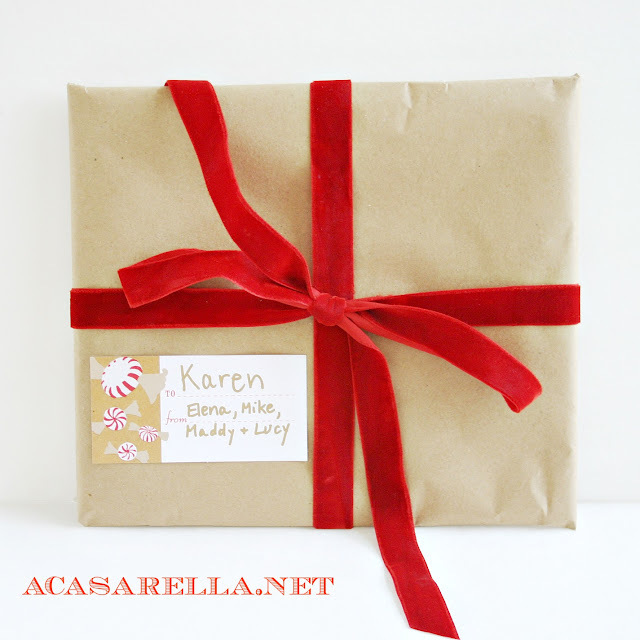 Sometimes it's hard for me to believe that I am into my fourth year of blogging. Where did the time go? Looking back at the archives it is interesting to see the evolution of the spaces that I've featured since January of 2012. It's pretty obvious that I love my backyard—always have—so when Wayfair asked me to write about my dream patio, I almost passed. I mean, I kind of already have my dream patio, and, as evidenced above, I've already written about it. But then I began to wonder... what if I could start over? What if I could create an entirely different space? What if I had a blank canvas and cost wasn't an issue? What would I do under those circumstances? It was then that I realized I should absolutely write this post. You see, my current outdoor spaces are very homey/comfortable: big cushiony chairs, lots of faux wicker, warm tones, etc. Clearly that's a look that I love but it's not the only look to which I am attracted. More and more I find myself being drawn to fun, colorful spaces, both indoors and out. In addition, I love furniture and accessories that have a funky retro vibe. Doesn't this just make you want to throw a pool party so you can invite Gidget and all of her friends to hang out, drink root beer floats, and play lawn games in the backyard?? I'm not going to go through each item since the links above contain all of the important details. I do want to say that the entire look started with the blue seating group in the center (#7). Once I found that I just kept building around it. 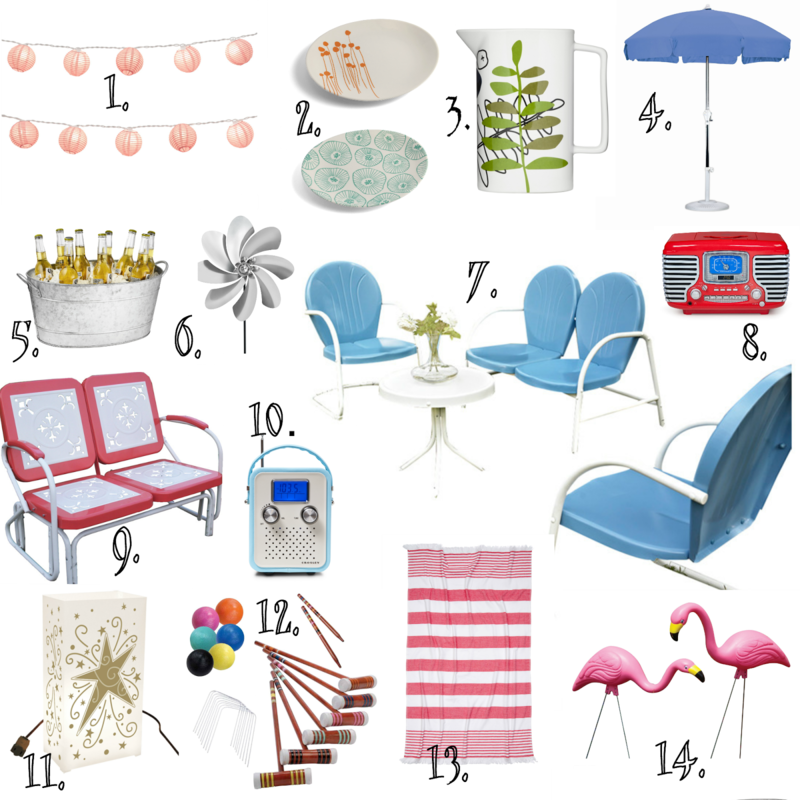 Some of my other favorite pieces include the cheerful Crosley Radios (which I loved so much that I couldn't choose between them) and the Carmel Stripe Beach Towel (which I am going to purchase as soon as I hit publish on this post). 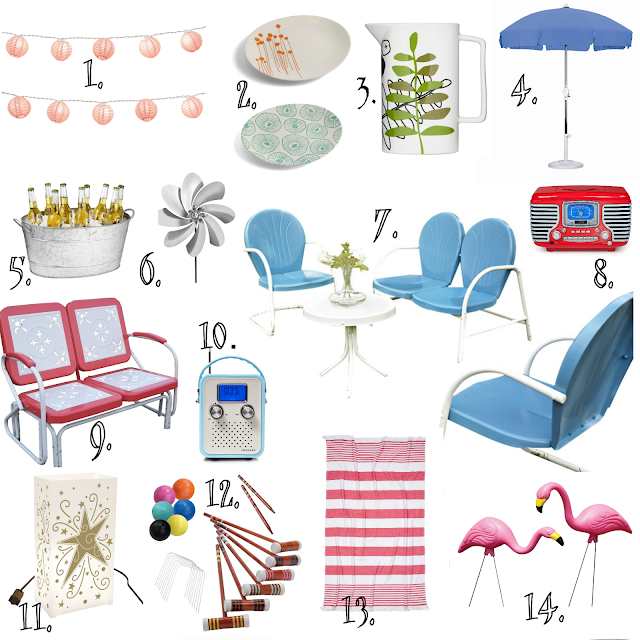 If this has whet your appetite for more colorful backyard wares, check out my newest Wayfair Idea Board entitled, "Dreamy Retro Patio" for additional items not pictured above. Great items! I like that vintage retro feel. Now to get with it on our deck. Thanks, Randi! I had a lot of fun putting it together! Great board! 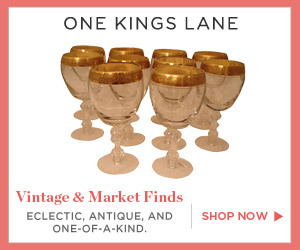 I love all things retro and vintage. This is so cute, totally makes me envision a retro pool party!